Check out our Sale page for other great deals! 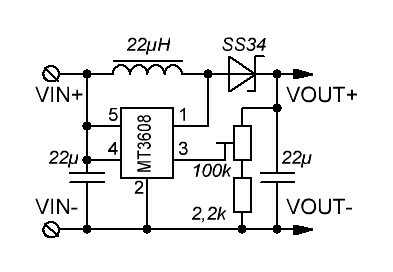 This module features the MT3608 2 Amp step up (boost) converter, which can take input voltages as low as 2V and step up the output to as high as 28V. The MT3608 features automatic shifting to pulse frequency modulation mode at light loads. It includes under-voltage lockout, current limiting, and thermal overload protection. Boost converters are a great way to easily increase a given voltage, but that boost comes at the cost of less output current compared to input current. Since this is a boost converter the output voltage has to be higher than the supplied input voltage. If you need to decrease (step-down) a voltage consider using a buck converter such as our LM2596 buck converter module. We also offer a 4A boost converter if you need more than the 2A of this module - XL6009E1 Boost Converter Module. There little puppies are perfect for converting USB power to 9v for guitar pedals and other musical equipment. Wired it all up and stuck it in a mini Altoids tin. Very reasonably priced as well!